Project Blue, which aims to find an Earth-like planet around the neighboring Alpha Centauri star system, has begun a crowdfunding campaign to raise the first million dollars for the ambitious mission. The campaign will run until Dec. 21, 2016. Project Blue, an ambitious initiative to directly image planets around the double suns of Alpha Centauri, has started crowdfunding for its space telescope. The initiative would launch a small space telescope designed specifically to look at Alpha Centauri, which, along with Proxima Centauri, is the nearest stellar neighbor to Earth's solar system. Because of the star system's closeness, that small telescope would be able to take a "pale blue dot" image of any potentially Earthlike planets orbiting there — a photo of a small blue speck like the one the Voyager spacecraft 1 took of Earth from afar. A blue hue would indicate potential oceans or atmosphere surrounding the planet. A mission overview of Project Blue, which seeks to directly image planets around Alpha Centauri. 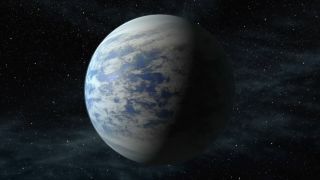 "We're at an incredible moment in history, where for the first time, we have the technology to actually find another Earth," Jon Morse, mission executive for Project Blue, said in a statement. "Just as exciting — thanks to the power of crowdfunding — we can open this mission to everyone. "With the Project Blue consortium, which is still growing, we'll bring together the technical experts who can build and launch this telescope," Morse continued. "Now we want to bring along everyone else as well. This is a new kind of space initiative — to achieve cutting-edge science for low cost in just a few years — and it empowers us all to participate in this moment of human discovery." Data from Project Blue might look like this simulation, with a blue dot indicating the distant light of a potentially Earth-like planet around Alpha Centauri. He and a project scientist described the complicated setup of deformable mirrors and a star shade that would allow the telescope to see a planetary speck within the glare of two stars. While the engineering project is challenging, the system's closeness to Earth — just 4.3 light-years — means the telescope can be much smaller and more affordable than if it had a more distant target, the researchers said. More general-purpose space telescopes, like Hubble and the recently-completed James Webb Space Telescope, would not be able to resolve the planet in the two stars' overwhelming glow. The project's first $1 million raised will go to "crucial analysis, design and simulations that form the foundation of the mission," the Kickstarter page reads. If more money is raised, the researchers also have stretch goals: $2 million will allow them to test the coronagraph that lets the telescope spot planets around the bright glare of Alpha Centauri's stars, and $4 million will let them finish the telescope's design, start building components, and incorporate interested students and universities into the building process. People who help fund the project will earn mission patches, first looks at eventual photos, a 3D crystal rendering of the telescope, pieces of spare hardware, and special access to the mission scientists and building process, depending on funding level.